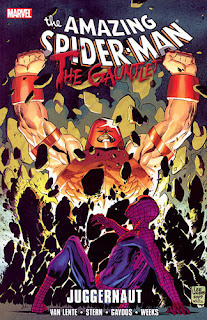 Despite the name, Spider-Man: The Gauntlet Vol. 4: Juggernaut has very little to do with the “Gauntlet” story cycle, which saw a number of villains upgraded by the Kraven family. This lack of tie-in to the ongoing story is actually a good thing considering that the rest of the trade is doing its hardest to win back old-school Amazing Spider-Man fans. Three years later, the “Gauntlet” storyline, and the “Grim Hunt” story it led up to, are just bumps in the road for Peter Parker. The first story collected here, “The Sting,” by Fred Van Lente and Michael Gaydos, is the one most clearly set in the modern era, with an appearance by the new, female Scorpion and references to the then-ongoing “Dark Reign” plotline. Instead, most of this trade is given over to a rematch of one of Spider-Man’s greatest battles of all time. If you’ve never read the original “Nothing Can Stop the Juggernaut!” two-parter from Amazing Spider-Man #229-230, then don’t worry; it’s collected here at the back of the trade. In it, the Juggernaut decides to kidnap Spider-Man’s psychic advisor, Madame Web[(!) -- ed. ], and use her skills to benefit himself and his crime partner, Black Tom. The destruction he causes while trying to get across New York City is secondary to his lack of concern when he disconnects Web from the machinery keeping her alive and doesn’t care about killing her. It’s this callous act that really drives Spidey up the wall. Spider-Man (and other heroes) have a tendency to internalize their conflicts so that everything is about them; Spidey has such bad “luck” because he often perceives the world as being out to get him. Roger Stern wrote both the initial story and this sequel (from issues #627-629), and Stern’s run on various Spider-titles in the '70s and '80s is often considered to be a master class on how to write the character. His Spider-Man is constantly entangled in both social and crime-fighting morasses; both approaches provide numerous story opportunities. It wouldn’t surprise me if Dan Slott was directly influenced by Stern in creating the current Amazing Spider-Man status quo, since the state of Peter’s life then and now seems quite the same. Having Peter fight the Juggernaut was actually a novelty in the early 1980s. The Kingpin had switched to become Daredevil’s arch enemy just a year beforehand, and it would take Secret Wars to really introduce a lot of the various heroes and villains to each other. So how did Spider-Man defeat the Juggernaut? Once again, it was luck, this time involving some newly-laid cement. This didn’t take him out for long, and Stern explains his escape from the concrete tomb (involving smashing through a fault line) in some wonderful retro flashbacks from Lee Weeks. The broken fault has taken years to create an earthquake, and to save New York from devastation, it’s up to . . . Captain Universe! The reappearance of Marvel’s roaming power set makes a lot of sense, as Spidey wielded these powers during the Acts of Vengeance crossover to take on other high-powered villains. I almost wish Stern could’ve figured out a way to work in the fight with Firelord so that all three of Spidey’s greatest outmatched fights could have been referenced. The Captain Universe powers bond with those considered worthy. In this case, they start out being wielded by Will Nguyen, a stockbroker whose life was ruined by the Juggernaut’s rampage in issue #229. Lee Weeks studied the original art by John Romita Jr. and made the panel of Will’s office’s devastation look like a “lost panel.” It’s at an angle not seen in the original story since the viewer was following the Juggernaut from outside the office, not inside. Will lost his job because his firm was ruined after its building was destroyed. It’s yet another case of “luck”, whether good or bad, being internalized, and Will’s desire for vengeance is so bad that he nearly lets New York get destroyed out of spite. I won’t spoil how the story ends, but the Juggernaut does get some redemption, setting him up for Thunderbolts and beyond. This trade closes out with a fun little back-up story in which Peter once again fails to get a job. It’s not his fault; he’s stuck fighting the Absorbing Man and even ends up saving his phone interviewer, but in the end, he sacrifices the job to save his identity. Last week, the Absorbing Man nearly killed Thor in Thor Visionaries: Walter Simonson Volume 5, so it’s fitting that this story about fighting impossible foes ends with yet another unstoppable villain. If nothing else, it’s nice to see Tom Peyer and Todd Nauck getting work; Peyer especially has been out of the limelight for a long time. By the time “The Gauntlet” came out, the Amazing Spider-Man creative team had some idea of the concerns of the readers in the post-One More Day world. Having Roger Stern come back was one way to appeal to those who dropped the books. It’s rare for Marvel to collect an original story and its sequel in the same trade; the only example I can think of off-hand was the X-Treme X-Men sequel to “God Loves, Man Kills” coming with a reprint of the original graphic novel. Stern’s revisit of Spider-Man and the Juggernaut in The Gauntlet: Juggernaut is a great detour from some of the weaker elements of the “Brand New Day” relaunch. The further they get from the dissolution of Peter Parker’s old life and marriage, the better off they end up (which is why Superior Spider-Man is appealing in a kooky way). Next week, Transgivukkah begins again, starting with a return to the Lost Light in Transformers: More Than Meets The Eye.